September 6, 2012 - Bombardier Aerospace's Learjet 75 jet continues to achieve its development milestones with the first powering up of the aircraft's electrical systems on the Wichita production line. Aircraft power, including to the new Bombardier Vision flight deck, was switched on during the week of August 21, 2012, as the aircraft progresses towards its 2013 entry-into-service. "This is a fantastic achievement that highlights the tremendous efforts of every single person involved with this project," said Ralph Acs, Vice President and General Manager, Learjet, Bombardier Business Aircraft. "This milestone represents a significant step forward for our Learjet aircraft family, as we were able to seamlessly integrate the Learjet 75 jet into our production flow. More importantly, this aircraft, our very first complete Learjet 75 aircraft, will play a pivotal role in the certification program. "We have seen major changes to the aircraft's wiring harness to accommodate the Garmin avionics, the heart of this totally new Bombardier Vision flight deck arrangement," added Acs. "Not only did this require tremendous dedication from our Wichita team, but such a feat would not have been possible without our Belfast and Toronto sites." 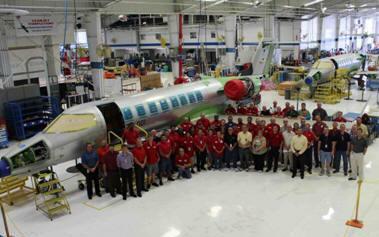 The Learjet 70 and Learjet 75 test aircraft are continuing their development work as the program moves forward. There will be a total of five flight test aircraft: a modified Learjet 40 XR jet and a modified Learjet 45 XR aircraft are flying and focusing on avionics certification; a modified Learjet 45 XR jet will be used primarily for the interior and cabin management system; an existing Learjet 45 XR aircraft will be modified and utilized for testing and validating the performance improvements; and finally, the first production Learjet 75 aircraft. A breakthrough in business aviation, the Bombardier Vision flight deck is designed to deliver a completely new cockpit experience by combining the best in technological advancements with superior design aesthetics. As such, it provides pilots flying the Learjet 70 and Learjet 75 aircraft an unprecedented level of control and comfort. The Bombardier Vision flight deck for Learjet 70 and Learjet 75 aircraft will feature the fully integrated Garmin G5000 digital avionics suite, designed with leading edge technology and one of the most intuitive crew interfaces available. The Learjet 70/75 are the latest Learjets development program by aircraft manufacturer Bombardier Aerospace. The light business jet is being introduced in anticipation of business aircraft recovery predicted by Bombardier. These models will feature new avionics, winglets and powerful engines that use less fuel. The airframe is based on the Learjet 40 and 45 models with modifications to improve performance. Canted winglet design will be incorporated from the Global 7000/8000. Bombardier is targeting deliveries beginning in 2013. Learjet 70 aircraft offers unrivalled interior design aesthetics blended effortlessly with the latest technology. The cockpit features the peerless Bombardier Vision flight deck, and this aircraft can fly a range of more than 2,000 nm (3,704 km)*. It retains the classic Learjet lines and legendary performance, and as such, can connect Seattle with Montréal. Learjet 75 aircraft features the pioneering Bombardier Vision flight deck with an interior influenced by its bigger stablemate, the Learjet 85 aircraft. This jet will soar above the traffic with a maximum altitude of 51,000 ft. (15,545 m), is capable of flying more than 2,000 nm and is able to fly nonstop from Wichita to Bermuda.